Early last week the animal activist group Direct Action Everywhere released a harrowing video based on an undercover investigation of Petaluma Farms, a Northern California operation that supplies eggs to Whole Foods and Organic Valley. In it, hundreds of chickens are shown crammed into sheds and suffering several obvious ailments, including respiratory distress and being stuck in feces. He summarized what he encountered in these terms: "crowding, stress, filth, disease, and, finally, mutilation and death." This is not what your average Whole Foods shopper has in mind when she picks up a carton of Organic Valley eggs. But it's exactly what's happening on the farm, and consumers have a right to know about it. And The New York Times had an opportunity to inform them. Indeed, Direct Action Everywhere's investigation was evidently significant enough for the Times to cover it (in its business section, oddly enough) - and the paper deserves credit for lending the matter some ink. Most of the Times piece is dedicated to allowing the industry to defend itself rather than driving home the details of the video, which it calls "disturbing" in its lead, but never indicates why. 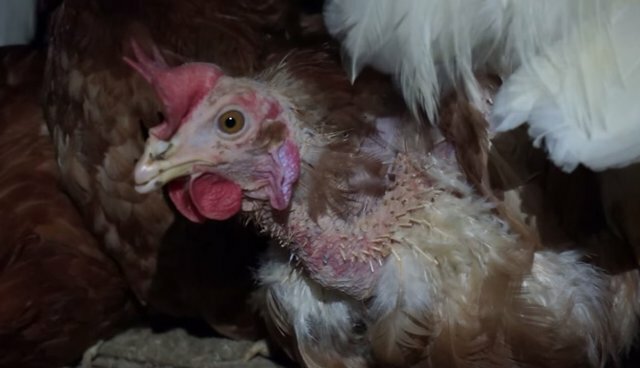 Before offering any of the video's content - which, as you can see for yourself, is horrific - the article instead focuses on this point: "The hens in the video belong to Petaluma Farms, whose owners assert that the group is distorting and exaggerating the conditions under which its organic and conventional eggs are raised." With that, the tables are turned and the investigation is under scrutiny.